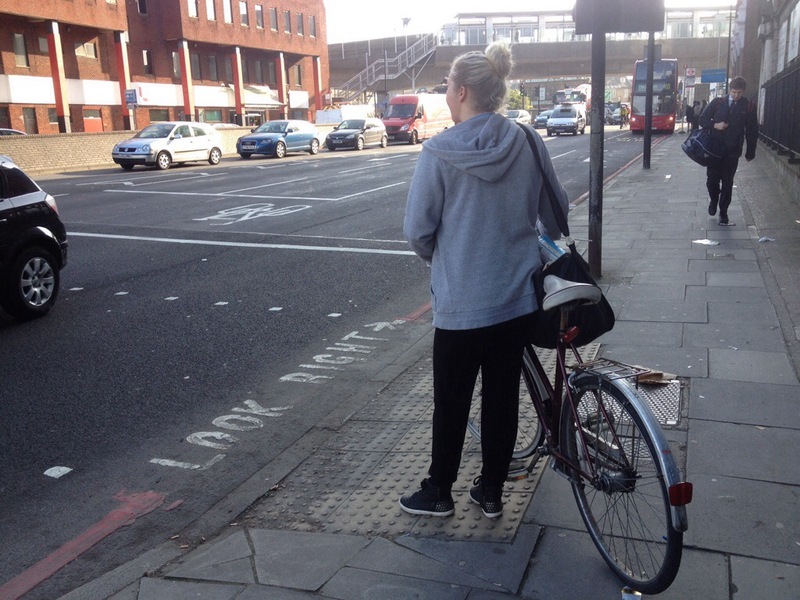 Waiting to cross at Deptford Bridge…a long wait. Ironic or indicative, I wondered as I struggled to find a convenient and secure place to park my bike outside Palestra, on Blackfriars Rd, where I was about to attend a meeting discussing TfL’s plans for the junction at Deptford Bridge. There were three of us from Lewisham Cyclists and seven of the team charged with the development of the scheme. We have already sent them our initial response, which you can find in our post on this website dated 6th November. It includes a recommendation that they consider completely redesigning the junction, a redesign it has sorely needed for many years, rather than just tinker with a few lights which bring pedestrians some limited improvements but does nothing positive for cyclists, although, disturbingly, does create some serious safety issues for them by the positioning of some advisory cycle lanes. We included a schematic drawing showing how our vision for such a redesigned junction could work. The discussion that ensued was lively and pretty passionate. It soon became apparent that the members of the TfL team here, had neither the budget nor the power to diverge so radically from the brief they had been given from above for the improvements to the junction and, even if they wanted to, could not make a decision to adopt a more extensive scheme. However hard and convincingly we argued, it wouldn’t really matter in this arena. Deptford Bridge is no longer on the Better Junctions list (not enough of us killed and seriously injured there yet) so the money and the political will from those in charge of the folks we were talking to is just not available to do much more than put in a few pedestrian crossings and paint a few green lanes and ASL’s h ere and there. To be fair to some of those on that TfL team, it seemed they might relish the chance to do a better job and design something more radical. Which was a little heartening in what was otherwise a difficult meeting. So, we are going to take another look at the plans. We need to make sure that even if what we want doesn’t happen now, at least nothing dangerous for cycling gets put in. So, basically, in the short term, we are going to attempt to make the best of a bad job. But, at the same time, we will continue lobbying for a more radical approach to a proper redesign of this horrible junction. Any support here would be valuable and much appreciated. And we will contact those that do control the purse strings and decision making and make them aware of the mistake they are making at this junction, by not giving their employees the opportunity to do the best job possible here and hopefully, persuade them to recognise that they need to get at least one junction in Lewisham right as soon as possible.